"Why bother?" It is perhaps the lament of the person who returns to confession again and again, confessing much the same sins, the same fears, the same attitudes that fall short of the Gospel ideal. With the best of intentions and a firm resolution, the prayers are prayed, the cleansing received, and perhaps this struggling person walks out with at least a bit of hope that this time, things could be different. When John the Baptist appeared out of the desert, offering a baptism of repentance for the forgiveness of sins, perhaps there were some in the crowds who experienced a similar hope. They didn’t know who this Baptist was or where he came from, but he was offering them something they could do. And that something, a baptism of repentance, suggested one central possibility: that by the grace of God, things could be different. As you and I look around at our world, isn’t that what we need to believe? And is that perhaps something of the hope that Advent offers? We need to believe that things can be different. When we look at our own lives, at the struggles of the people we love, and especially at the society that surrounds us, we see so much that needs to be different. And Advent calls us to celebrate why we even bother. Yes, we are mired in our own selfishness and greed. Yes, we see mountains of hatred and bigotry that desperately need to be made low. We see people wallowing in the delusions of their own lies and those of their leaders, dark valleys so in need of being filled. Again and again, the body count rises, the grief grows deeper, and blame is flung all around, as violence is hyped as a solution rather than the problem. But listen! There is one coming, greater than the Baptist, bringing a day “filled with the fruit of righteousness." He has called and enabled us to continue a work that we did not begin. He, the one for whom we wait, has begun this good work in us, and he will bring it to completion." And so, we bother. We bother to work for a living wage for all, especially the voiceless and the outcast. We reject the falsehoods of evil ideologies that deny the dignity of some, because of the color their skin, or their religion or their country of origin. We reject the belief that some need to be killed because of their guilt, or their age, or their illness. We extend a hand in friendship rather than raising a fist in rage. We build bridges rather than walls and create a space for those who find no room at the inn. We bother, because one is coming, greater than the Baptist. We work to prepare the way, we labor to straighten his paths. We bother, we repent, and yes, we even rejoice, because in Him it can be different. Fr. 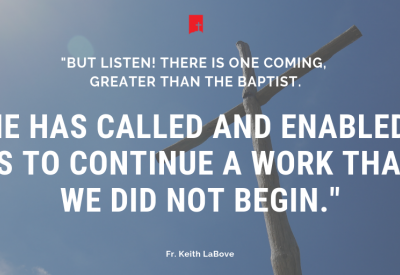 Keith LaBove is the pastor of St. Patrick's Catholic Church in Lafayette, Louisiana.